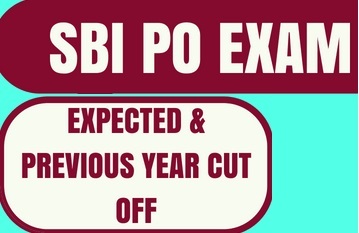 In this post I am going to tell you about the SBI PO Preliminary Exam Cut Off for the previous years as well as expected cut off. I will discuss only about Preliminary Exam Cut Off in this post and will discuss about Mains Cut Off in a separate post. SBI PO Exam is conducted by SBI every year for recruitment of the Probationary Officers. SBI is having separate recruitment process for SBI Clerk and SBI PO and it is separate from IBPS. SBI PO is a very popular exam and the post carries attractive salary and allowances. The Exam consists of Preliminary Exam, Main Exam, Group Discussion and Interview. The first hurdle is preliminary examination therefore first your focus should be to clear the Preliminary Examination. Let us discuss about the SBI PO Preliminary Exam Cut Off for the previous years as well as expected cut off for this year examination. First see how the cut off has remained in the last three years. This will give you an idea about the expected cut off as well. I am giving here only overall cut off of the previous years as SBI has removed the bar of sectional cut off from this year. It means that there will not be any sectional cut off in SBI PO Preliminary Exam this year. Today I will explain you about SBI PO Eligibility Criteria. SBI PO notification is released every year and it is very important you to understand the eligibility norms for this very important and popular exam. Before applying for the SBI PO, please check the eligibility norms and thereafter apply. In this post I will explain all the important criteria on which eligibility is decided. The main eligibility criteria for SBI PO are nationality, age, qualification, percentage of marks, number of attempts etc. SBI Probationary Officer is for Indian Citizens. Selected candidates will be posted anywhere in India. This one is very important. You must check the eligibility criteria to see whether you possess the required qualification for this job. To be eligible for SBI PO candidates must have a graduate degree in any discipline from a recognized University or from an equivalent qualification recognized by the Central Government. Those who are in the final year of their graduation or in the final semester can also apply for SBI PO provided that if they get an interview call they have to produce proof of having passed the graduation exam. A candidate who possesses the qualification of Chartered Accountant is also eligible to apply for SBI PO. Candidates having Integrated Dual Degree (IDD) certificate should ensure that they have the proof of passing the IDD before the cut off date given in the notification. The percentage obtained in the Graduation is to be indicated to the nearest decimals in the online application. In case CGPA / OGPA are awarded, grades are required to be converted into percentage while filling up online application. In case of an interview call a candidate has to produce a certificate from the University regarding conversion of grades into percentage and the percentage of marks scored by the candidate in terms of these norms. The percentage marks shall be arrived at by dividing the total marks obtained by the candidate in all the subjects by aggregate maximum marks. The fraction of percentage so arrived will be ignored i.e. 59.99% will be treated as less than 60% and 54.99% will be treated as less than 55%. What is the minimum percentage required for SBI PO? This is a common question among the aspirants. There is a general perception that certain minimum percentage in Graduation is required to be eligible for SBI PO. However there is no such bar. In SBI PO notification nowhere it is mentioned that minimum percentage is required. It means there is no percentage bar in graduation to be eligible for SBI PO and anyone who has passed graduation is eligible for SBI PO. For SBI PO the minimum age required is 21 years and upper age limit is 30 years as per the cut off date of the notification. Relaxation in upper age is as per the government norms. Candidates with record of default in repayment of loans / credit card dues and /or against whose name adverse report of CIBIL or other external agencies are available are not eligible for appointment. Candidates against whom there is / are adverse report regarding character & antecedents, moral turpitude are not eligible to apply for the post. So these were the major eligibility criteria to be eligible for SBI PO. Please also check official notification before applying for SBI PO. State Bank of India has announced that there will be no sectional cut-off and category wise merit list will be drawn on the basis of the aggregate marks scored in the Preliminary Exam. In the latest SBI PO notification released on 02.04.2019 SBI has removed the criteria of sectional cut off. What it means? It means that earlier students had to qualify in each of three sections viz. English languages, Quantitative Aptitude and Reasoning Ability, separately, to qualify for the prelims. Now there is no such barrier even if you have not qualified any section but score high in overall merit you can still qualify the prelims examination. In this post I am going to tell you about the time management tips for SBI PO Preliminary Examination 2018. Friends, time management is key for any exam and particularly in Bank Exams it is the ultimate key for success. Also watch the video given at the end of the post for important tips and for scoring high marks in the exam. I am going to give you a few important tips which will surely help you for upcoming SBI PO Preliminary Examination 2018. Lacs of students appear in this exam hence even a fraction of mark is very important, therefore for you it is important to focus on the right strategy apart from the studies and preparation. Time management is one of the key strategies. Before talking about the time management I would like to tell that you must be well aware of the exam pattern of the SBI PO. Exam pattern should be crystal clear to you. I am explaining here exam pattern of the prelims in brief for those who are having any doubt about the exam pattern. There will be three sections namely English Language, Quantitative Aptitude and Reasoning Ability. In English Language there will be 30 questions while in other two sections number of questions will be 35 each. Hence there will be 100 questions of 100 marks. Time limit will be 60 minutes. The prelim paper is only of 60 minutes. Intense focus is needed to get you through this paper. Do not get distracted. Know your strengths and weaknesses before you go in for the exam. Attempt the questions that you know you can sail through. Do not try to experiment during the exam. Do not get attached to any question for long. Solving a difficult question would give you the same marks as a easy ones. So invest your time in questions that are worth it. As per past trends, about 15% of the questions in the paper will be ‘difficult’. Again, it is advisable to save these questions for later. Assign time to each question and stick to it. Drop a question if it is taking much longer than your assigned time-per-question. Also watch this video for important tips and for scoring high marks in the exam. 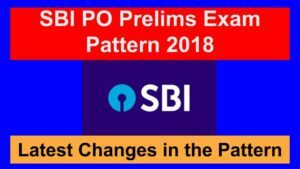 Today I am going to tell you about the SBI PO Preliminary Exam Pattern 2018. State Bank of India has recently announced its recruitment notification for Probationary Officers Posts. SBI PO is one of the most popular and sought after Banking Exam. SBI PO is considered best banking job available in India. The salary and allowances in SBI are much more than any other government or private sector bank for similar post. SBI PO exam is also considered to be the toughest exam as far as banking exams are concerned. The level of questions asked in SBI PO is quite high and every year a few new type of questions are introduced in the exam. Therefore to qualify SBI PO you need to prepare in a special manner as ordinary preparation may not help you to get through. SBI PO selection process consist of three stages which are preliminary exam, main exam and group discussion and interview. In this post I will tell you about the exam pattern of the preliminary exam. Main exam pattern as well as about group discussion and interview I will discuss in next post. So let us now understand about the preliminary exam pattern of SBI PO. English Language: There will be 30 questions of 30 marks which are to be solved in 20 minutes. Quantitative Aptitude: There will be 35 questions of 35 marks which are to be solved in 20 minutes. Reasoning Ability: There will be 35 questions of 35 marks which are to be solved in 20 minutes. Therefore you can see that there will be 100 questions of 100 marks which are to be solved in 60 minutes. Further, please remember that there will be penalty for wrong answers marked in the Objective Tests. For each question for which a wrong answer has been given by the candidate one fourth of the marks assigned to that question will be deducted as penalty to arrive at corrected score. If a question is left blank, i.e. if no answer is marked by the candidate, there will be no penalty for that question. There will be sectional timings in Prelims. There will not be sectional cutoffs in Prelims. Key to Success in Preliminary Examination: The key to success in the preliminary examination is speed and accuracy which you can develop through practice only. Conclusion: As I have told you that SBI PO is most popular banking exam. Every year lacs of students appear in the preliminary examination for very few vacancies. Therefore if you really want to qualify this exam you should start your preparation with proper planning.